Image Size: 26"w x 40"h.
After a period of personal loss, Steve Hanks began a series of paintings visualizing his healing process. This inspiring series, which can be found in its entirety in the book "Moving On: The Art of Steve Hanks," follows the artist’s emotional journey from despair to hope. "Waiting in the Rain" is one of the last paintings in the healing series. Although teachers often cited his artistic ability, Steve Hanks’ main interest while growing up around San Francisco was sports. As a young teenager, Hanks pursued surfing and tennis with passion. He eventually tired of a steady diet of competitive tennis, but continued to surf, finding a spiritual connection with the ocean. “Surfing had a strong influence on my paintings,” he says. “The ocean often appears in my work, because I have such strong feelings for it.” Although it was apparent early on that he had talent, Hanks refused to do the required assignments in his high school art class and earned a grade of C in the class. “To prove I was good, I did a one-man show at the high school and sold my first painting to another art teacher,” he says. After high school Hanks enrolled in summer session commercial art courses at the Academy of Art in San Francisco. “The only way I could convince my parents to let me go was to say I was going into commercial art,” he says. “I didn’t even know what that was!” He did well in his commercial art classes, but it was a life drawing class that captured his interest. He focused his energy on the study of anatomy and figure drawing and transferred into the California College of Arts and Crafts in Oakland, California. He graduated in the 1960s with a Bachelor of Fine Arts degree, and then moved back to New Mexico in search of a home art gallery. Initially, he drew in pencil and painted in oils. His paintings were impressionistic while his drawings were more realistic. Eventually, an allergic reaction to oils forced him to experiment with watercolors. Using the techniques learned from other mediums, he found he could create watercolors as “finished” as oils. Deeply affected by the emotions, shifting attitudes and music of the 1960s, the music of 60s icon Bob Dylan often accompanies Hanks as he paints in his studio today. 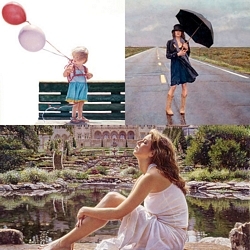 Steve Hanks’ paintings are much more than endearing images of women and children. Rather than conveying a specific message through his paintings, Hanks prefers to explore memories and emotions. “All art is an escape to somewhere you want to be or a feeling you want to have," Hanks says. "People see different things in my paintings because we all have different backgrounds and feelings.” Hanks highly collected nudes convey an introspective solitude that prompts the viewer to think about his or her own life and path. “Women occupy a special niche in my sensitivity. They express more storytelling ability. There’s more magic in them,” he says. Art jurors began recognizing the quality of his work in 1973. Steve Hanks won the Arts for the Parks Marine Art Award of Excellence in 1990 and 1994, and has been one of the Arts for the Parks top 100 artists since 1989. In 1991, Steve Hanks received the National Watercolor Society Merit Award and the National Academy of Western Art awarded him the Gold Medal in 1992. Since 1993, he has been one of U.S. Art Magazine's top ten American artists. When the Pacific Rim show in Seattle, WA decided to open the show up to a wider variety of art in 1999, they selected Steve as Artist of the Year. Steve was one of five winners selected to the U.S. Art Hall of Fame 2000. He was named as one of the top 25 selling artists in the June, 2002 issue of Decor magazine. The 7th Annual Andre Agassi Grand Slam for Children chose Steve as their Feature Artist in 2002.